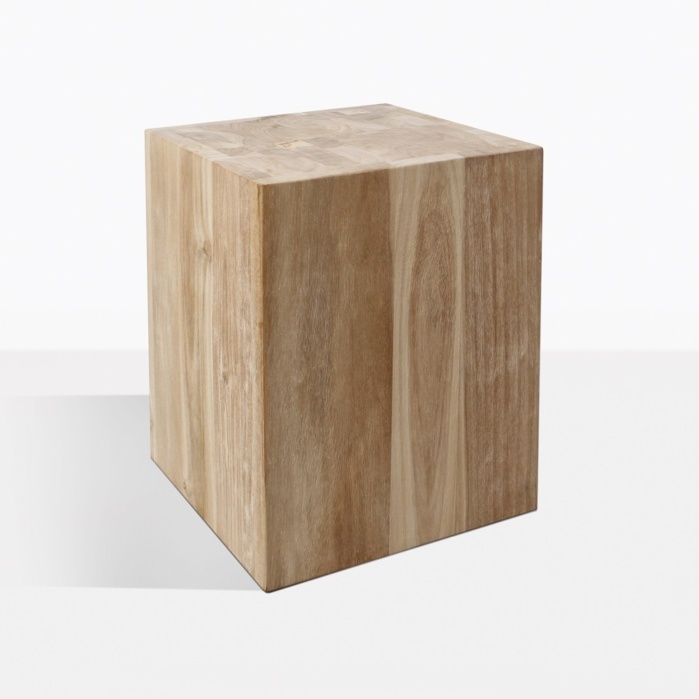 Made of raw teak, the Gabby Side Table, is a perfect mix of rustic elements and modern design. This symmetrically designed side table is clean and contemporary. Although simple in design, it lacks nothing in character. Whether you use it to add contemporary details to an entryway or accent your outdoor space, the Gabby Raw Teak Side Table is an addition for all spaces. The perfectly proportioned side table acts as a blank canvas for your creative urges. 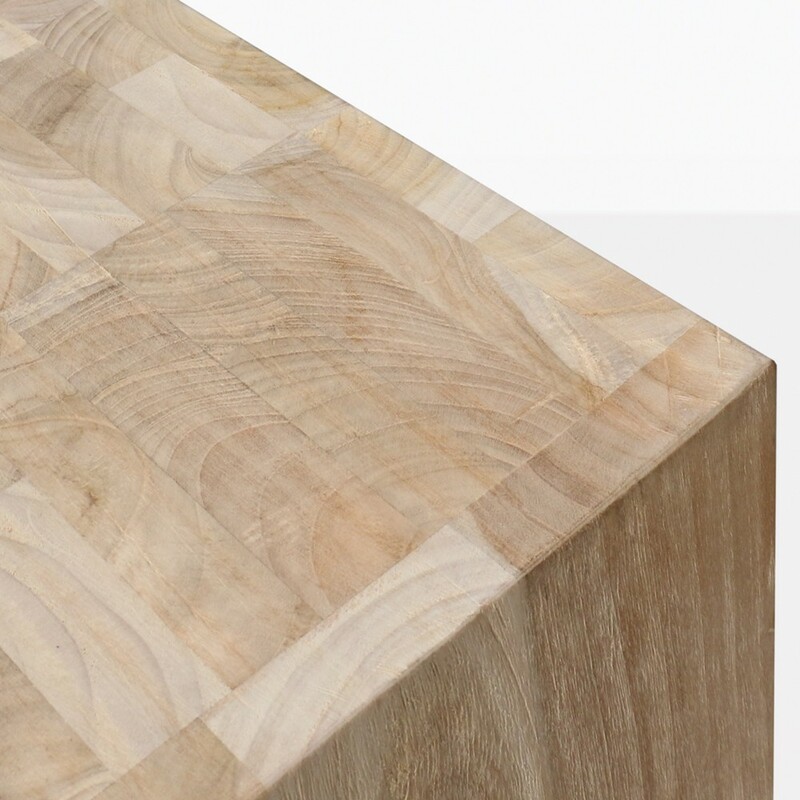 The light color of the raw teak, the linear shape and raw feel, lends itself as the centerpiece or an addition to a number of our outdoor sets. The color variations of the wood brings to mind something created by a southwest landscape, creating visual brilliance. With roots in tradition, this side table goes beyond a singular style having the ability to transcend indoor and outdoor spaces. For product details, ordering assistance and more, call us to speak to our furniture specialists today. Pre-order now! More coming soon. Bring elements of mild contemporary sensibilities and an austere structure into your home with the Gabby Raw Teak Side Table. The equally sided dimensions of this well-crafted accent table gives you the creative freedom to create a space with a unique awareness. The feminine pale wood paired with the masculine structure of the table makes the Gabby Side Table a remarkably transcendent piece. This side table looks incredible placed between a couple accent chairs or among multiple accents as a group. Use several in a row or spread them out to place potted plants atop or to add variety to an indoor or outdoor space. The raw teak has a gorgeous soft tone of undulating wood colors to bring a natural and organic feel to your space. Teak is the premium wood to use for outdoors. It ages naturally and graciously over time, is UV and weather resistant, and is resistant to insect damage. The wood requires minimal maintenance and when properly cared for will last for many years. Make this romantically rustic accent part of your home décor.